En rapport från Oakland spelningen som var den 22 november 2009. Sure, there are some new wrinkles (especially on Gene Simmons’ face), but, for the most part, the concert I saw on Sunday at the Oracle Arena in Oakland was pretty much the same one I witnessed on Nov. 25, 1979 at the Cow Palace in San Francisco — which was my first KISS concert. And we wouldn’t want it any other way, right? There’s part of me that loves seeing a band that, despite going through some lineup changes and releasing several new albums, really seems to come out of a cryogenic chamber each time it steps onstage. There’s something reassuring about knowing that KISS continues to march to its own platform-shoed beat, one that is no more or less in step with the music industry than when I first fell in love with the band. But there’s also something deeply disturbing about that, especially if you’re one who appreciates good music. KISS is the ultimate example of style over substance. There’s probably not a single other act on the planet that can boast KISS-like stats, in terms of longevity or popularity, with a weaker overall song book than these men in makeup. KISS has succeeded, for better or worse, not because of its music, but in spite of it. and school-age kids, some with their faces painted up like their heroes, rocking out next to adults that could probably remember buying 1974’s ”Hotter Than Hell” on vinyl or 8-track. 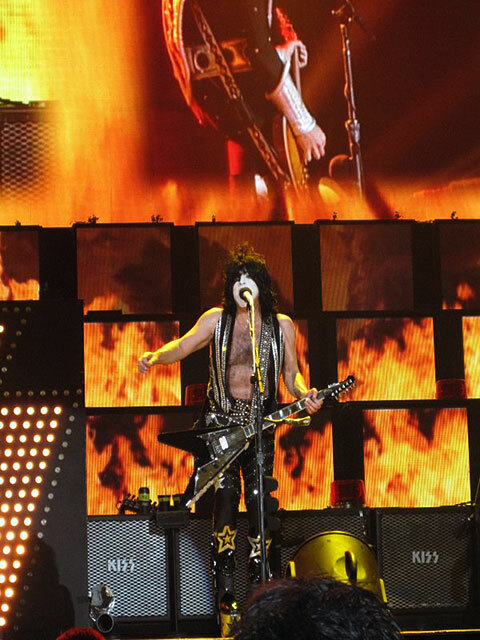 KISS gave these locals everything they could reasonably expect: a high-octane show short on memorable tunes and big on thrills, chills and frills. The lads stuck mainly to fan favorites — simple party anthems like ”Rock and Roll All Nite” and ”Detroit Rock City” — but they also mixed in two tracks from ”Sonic Boom,” the band’s first new studio album in more than a decade. It didn’t really matter what they played. The fans were there to see the sights, and there was indeed much to see. 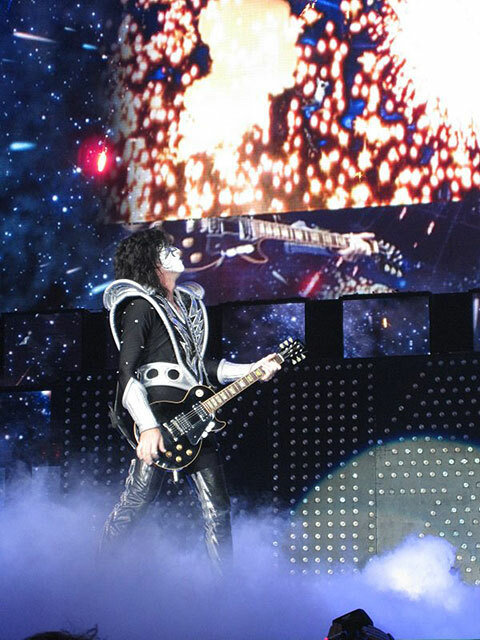 Vocalist-guitarist Paul Stanley flew across the crowd, drummer Eric Singer pulled off a thundering solo from a rotating set and guitarist Tommy Thayer shot fireworks from his ax. The latter two, most significantly, also did excellent jobs mimicking the two departed original members, drummer Peter Criss and guitarist Ace Frehley. If only Paul and bassist-vocalist Gene Simmons did half as well imitating their old selves then the band would really be cooking. Of course, every complaint that one could reasonably have about KISS 2009 melts away when Simmons goes into full-on demon mode. It’s still one of the best moments in rock ’n’ roll when the bassist gargles fake blood, wags his tongue (so long that people probably still believe the rumor that he had a cow’s tongue sewn onto his own) and then flies up to perform from the lighting rig. That’s why people come to see KISS. And, in that respect, they get what they came for. It will be interesting to see if KISS, nominated this year for the Rock and Roll Hall of Fame, ends up being enshrined. One can’t deny the influence the band has had: Without KISS, we wouldn’t have Gwar, Slipknot and Marilyn Manson — and, gosh, what a shame that would be. Still, a vote for KISS is a vote for style over substance, and I’m not sure that’s a choice Hall of Fame voters are willing to make. Furthermore, I’m not sure it’s one they should make. Somewhere between the first time they put on face paint and the decision to name their 11th album ”Lick It Up,” Kiss gave up any realistic possibility of growing old gracefully. There will never be a duet with Emmylou Harris, and even Rush probably has a better chance of getting in the Rock and Roll Hall of Fame. And ”Deuce.” And ”Black Diamond.” And ”Detroit Rock City,” which was a predictable if inappropriate closing song. Is there another band whose lyrics are easier to remember than Kiss’? Only two new songs off the just-released ”Sonic Boom” album were played, while almost everything from the 1975 concert album ”Alive!” made the cut. The band sounded just tight enough, Paul Stanley moved around pretty well and Gene Simmons was in good voice. As AC/DC proved, bands that shout their lyrics instead of singing them have a better chance of sounding decent in their AARP years. ”Cold Gin” and ”Calling Dr. Love” were highlights, and Stanley gets credit for (Springsteen take note) correctly mentioning the fact that the band was in Oakland at least a dozen times. Did we say Ace Frehley? The current incarnation of Kiss is bassist Simmons and rhythm guitarist Stanley, plus two other guys not named Frehley or Peter Criss. This would be fine (bandleaders lose their rock credibility when they don’t occasionally fire someone in a spectacular way) if Kiss didn’t insist on spotlighting lead guitarist Tommy Thayer so much. He’s a technically fine player, but everything from his Spaceman dress to the way he carried the guitar was a too-obvious imitation. The band did it right when they gave Eric Carr and Vinnie Vincent their own personas – even if their Fox and Ankh Warrior getups were ridiculous. The crowd still ate up every note, clearly having a good time despite a guy-to-girl audience ratio that must have been 13-to-1. (Only the aforementioned Rush and Promise Keepers meetings attract more dudes.) If you don’t have a hot date, calling Dr. Love is good consolation.